Milan Kordestani is a college student and an entrepreneur currently attending Colorado College. Before he graduated from Sacred Heart Preparatory in 2017, he started his own company called Milan Farms. It was established in 2015 to provide locally sourced products to consumers and to empower local farmers. Milan is currently still working on creating a nationwide distribution plan for small time poultry farmers to put their products in several major stores. Additionally, Milan grew pure saffron and raised chickens himself. In the Silicon Valley area, Milan Farms became a well-known label for eggs and saffron. Milan also researched aquaponic and hydroponic systems for growing saffron, and he used drip irrigation for better cultivation while maintaining non-GMO and organic standards for his farming practices. Milan is also a writer and an accomplished equestrian. When he was still in high school, he earned third place at the World’s Championship Horse Show. He also placed second in a specific category for the show, and he earned distinctions in other equestrian events. As a high school student, Milan published six articles for the Huffington Post in topics including politics, mental health and agriculture. Milan’s next venture is Guin Records, a music label he founded with his sister, Misha, to help undiscovered artists get their music heard. Milan is also the co-founder of a mobile application called Dormzi, which is set to launch in the summer of 2018, and is working on a book to help young entrepreneurs. 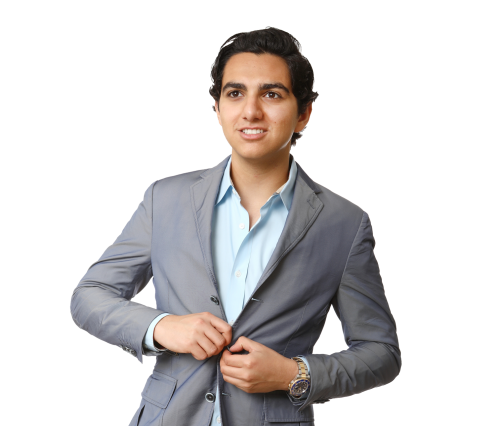 As someone who became a successful business owner before he finished high school, Milan is an inspiration to teen entrepreneurs today. In a recent interview, Milan shared details about his experiences and motivators. Part of my inspiration came from my upbringing. My parents are Iranian, and it was always important to my parents that my sister and I also value our culture. For this reason, my mother hired a Farsi tutor for us. My tutor’s mother grew saffron, which is a common spice in Persian dishes. After she gave me some saffron bulbs, I cultivated them in my garden while simultaneously developing a strong interest in agriculture. My mother encouraged my gardening and farming activities and let me keep chickens as well. I researched the agriculture industry extensively and pinpointed areas for improvement, and I found solutions for some issues that I saw as flaws. I learned a lot with my hands-on approach. I followed my passion, my gut and the path that felt right. The driving force behind my innovative ideas was the notion that everyone should have access to humanely raised meat or eggs at an affordable cost. I think every entrepreneur has doubts. I just worked past them. When people let their doubts take over, they hinder their own success. I just found solutions to problems and developed ways to put them into action. My passion for my beliefs kept me going, and my family encouraged me every step of the way. If you ask those closest to me, they’ll say that I’m often extremely optimistic and set very high targets for my projects. My over optimism comes from trying to shut-out any doubts I have. What is one marketing strategy other than referrals that you’re using that works really well to generate new business? I believe social media is very important. The intimacy of platforms such as Instagram are great for marketing. Users love to get the “inside scoop” without having to do much work on their part, like read long articles. For that reason, I made sure Milan Farms was always active on social media with whatever was going on with my chickens that day or the growing season. As for Guin Records, we constantly are posting videos and pictures of our artists in the studio, producing, etc. Dormzi is still up and coming, but Dormzi too will be largely marketed on social media. The toughest decision I’ve made recently was deciding which songs to cut from the first album I’m releasing. I spent several months working countless hours on so many songs and decided to cut down to the top 14 to make sure each one was unique, impactful, and had the right sound I was looking for. Cutting some of the artists and songs I really enjoyed with was tough, but I knew it had to be done. I think the passion behind my ideas and work ethic makes me successful. My passion drives me work ethic, and I succeed when I do what is necessary to bring my ideas to life. When I have an idea, I just get started on it. I never wait and let it get stale or let myself lose interest. I also feel like the support from friends, family and team members helps me succeed. There’s a lot of firsts that are very satisfying. The first time I heard one of the songs I produced on the radio was satisfying, the first time I sold a carton of eggs was satisfying, the first time I published the Milan Farms website was satisfying, the first time I downloaded the prototype of Dormzi was satisfying, etc. It’s all the firsts I’ve gotten to experience in business. For Guin Records, I’m very excited about our Uncharted album being released on July 1 as it’s been 7 months of hard work in the making. I can’t wait for the world to hear what we’ve been working on and share all the talented artists we’ve been so lucky to work with. My co-founder Sabine and I are also working hard with Dormzi to ensure it comes out strong and make an impact on the lives of college students. I am excited about launching it and seeing where it goes because of our collaboration and innovation. Napoleon Hill’s “Think and Grow Rich” is my favorite by far. The content is relevant for everyone, and the combination of stories and advice paints a powerful map to success. That book helped me a lot as a young entrepreneur.